Origin: India. The communities of Gonda and Raj-gonds worn these masks because they were great admirers of Lord Krishna. These masks were worn by their descendants in dance festivals and were, in turn, honored with food and wine. Most of the masks were made with open eyes and closed mouth and nose. These features were applied on the surface. The wearer went from village to village to perform. Like today's dance troupes. Maria tribal youths also wear similar masks while performing and hunting. During their performances the audience makes inquiries regarding the harvest, rain, best dates for hunting and recommendation for the leaders of the group. The villagers took to heart all they were told. This is why I made the mouth "Open", so the tribal dancers could be "heard" loud and clear! 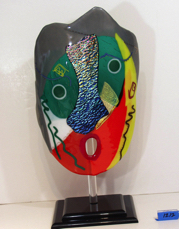 I make this mask in various colors using both translucent and opaque glass. Please inquire if you have a special coloration in mind. Approximately 11x13 on 8x8 black plexiglas base.